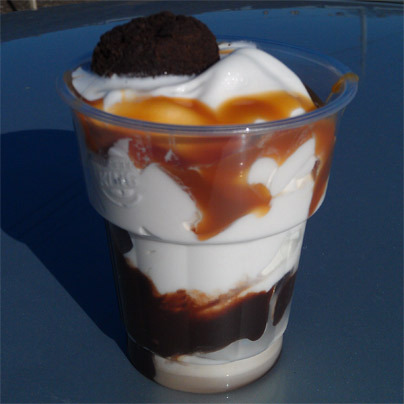 [New for 2013] Well, it looks like Burger King is going to continue it's new tradition of limited edition sundaes. That's cool by me because what did your parents and grandparents always tell you? Practice makes perfect. Here's my molten fudge sundae.... my itty bitty cute sundae, awwww, don't worry little buddy, someday you'll grow up and play with all the big sundaes. (official cup size is 9 ounces). Now the official media image shows the caramel and fudge drizzled together but we all kind of knew that wasn't going to happen in the real world. 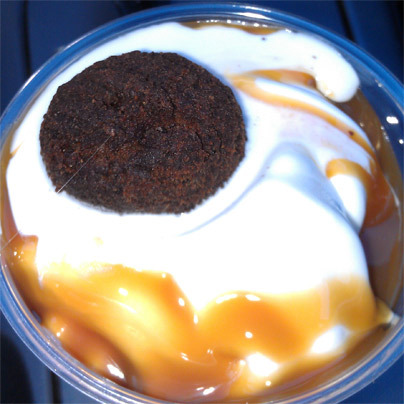 Instead, we've got chocolate on the bottom and caramel on the top which is fine by me because I'm not a huge fan of BK fudge sauce anyway. So we've got a still warm molten fudge bite on top and another down below that you can't see. Mmmmm, it's so warm that it's still giving off that freshly cooked smell (update: they are fried, not baked or microwaved). I take a bite of soft serve and caramel to prep my taste buds and then attempt to cut the fudge bite in two so I can take a picture (and spread out the flavor a bit). No go. The shell is surprisingly hard and I foresee making a giant mess if I continue my endeavor, so, I pop the whole thing in my mouth. Mmmm, so warm and smushy. I have to admit that it's fun to eat. It's like chomping down on a warm Dunkin Donuts chocolate munchkin (which is a chocolate cake donut if you've never had one). The downside is that I wish I had waited for this big bite. There is a bit of a warm funk that has me shudder for a sec. It's hard to describe, and it could just be me, but something about a warm gooey center and melted softserve just throws me off at first. 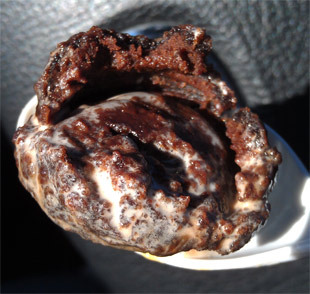 It's not like ice cream melting on a fresh gooey brownie, it's more artificial then that. I think if I had broken up that first bite and spread it around, I probably wouldn't have even noticed that much. The sauces are a hit and a miss for me. Sure the squirt of each may look neat, but flavor is what counts at the end. That's why I would rather see a double shot of sweet caramel sauce to play off the warm lava bites. I just don't think the chocolate adds anything, in fact, I think it takes a notch off this one. I quickly make my way to the end of the sundae and decide to take another crack at chopping these quarter size molten fudge bites in half. Doh! My spoon is stuck. Oh man, it's just one of those days. I take a bite and reveal the semi gooey insides. Sorry it didn't photograph well, but at least you can see the distinct dark outer shell, a bit of brown cake on the inside of that, and then the gooey center. You know what? I kind of prefer the bites by themselves. In fact, I think next time I'd rather just get a caramel sundae with an order of bites on the side. I think I'll enjoy myself more, plus I'll actually be full when I'm done. So overall, I think this was a neat little three dollar break, though I don't see this as a repeat purchase. It's just not 100% there for me. In a perfect world, I would love to see a bunch of smaller bites rather than 2 big bites. I realize they wouldn't stay warm very long like that, but I just think it would be a better treat. I appreciate the effort BK, keep on trying! Anon, it was only around for a limited time like most of bk's menu as of late.